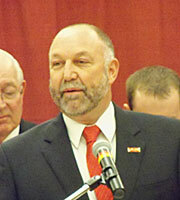 Iowa State University President Steven Leath has announced the members of a task force to study the future of Veishea. The annual spring-time celebration on the ISU campus was cut short last week when violence erupted on the morning of April 9 in the Campustown area of Ames. Students flipped over cars, ripped out street signs, knocked over light poles, and threw rocks and beer cans at police. Leath canceled the rest of the scheduled Veishea events for the week, saying in past years, violence during Veishea was blamed on non-students. But, this year it appeared ISU students were primarily at fault. Leath has appointed ISU senior vice president for student affairs Tom Hill to chair a task force with 18 other members, who will study Veishea and “assess its role and relevance for the future.” The group is expected to provide a recommendation to Leath by the end of June.